India beat Ireland by 52 runs to enter the semi-finals of the ICC Women's World T20, in a group league encounter at Providence in Guyana. Chasing a target of 146 last night, Ireland could make 93 runs for the loss of eight wickets in the stipulated 20 overs. 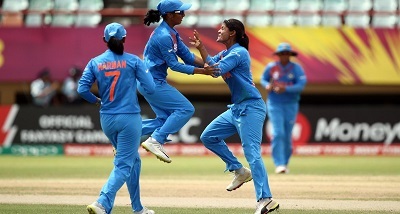 For India, Radha Yadav picked 3 wickets for 25 in four overs. Earlier, put into bat, India scored 145 for six with Mithali Raj scoring 51 off 56 balls and Smriti Mandhana supporting with 33 off 29 balls. With their third win, India with six points are assured of a last-four spot along with Australia.